Also called Tai Chi Ch`uan this is an ancient Chinese system of health improvement and personal development, which comprises a series of slow, graceful, flowing movements that promote harmony between body and mind. The movements can help strengthen joints, increase suppleness, increase vitality, improve posture, and balance all without unnecessary strain. With this page we hope to answer any queries and hopefully spark a little interest about a very special ancient Art. The training is varied and the many benefits accessible to every one of all abilities just come along join in everything and you will soon notice the benefits. Comfortable fitting shoes trainers are fine, trousers should be loose and not to tight around the waist and of course a smile as you will hopefully enjoy yourself. And sometimes a little self defence or some of our dynamic weapons forms. Who is my Tai Chi instructor? 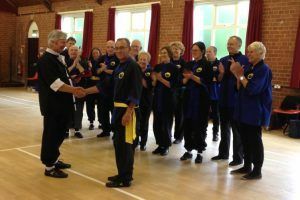 Steve has over 9 years experience of The Lee Style of Tai Chi and Feng Shou and is also lucky enough to still train with Howard at his monthly advanced class in Scarborough, his current grades are Tai Chi 3rd Tengchi.